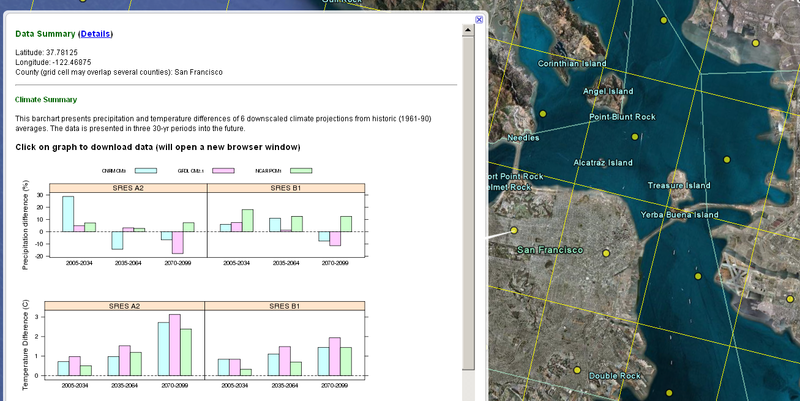 Temperatures and precipitation projections until 2100 under A2 and B1 emissions scenarios from 3 climate models, showing a marked increase in temperature for all scenarios shown. Precipitation futures are much more uncertain. In California, water supply is expected to decrease with the decline in annual snow pack associated with a warming trend in temperature. This presents water managers and sectoral planners with some difficult decisions and trade-offs. SEI researchers and collaborators are providing regional and local climate adaptation inputs to plan for climate change. Additionally, SEI is taking the lead in building Google Earth tools to visualize and make accessible climate risk information to a wide audience.